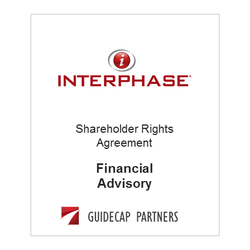 Interphase Corporation (NASDAQ: INPH), a provider of converged communications networks, has adopted a Shareholder Rights Agreement. The rights agreement is intended to continue to preserve for the Company’s shareholders the long-term value of the Company in the event of a potential takeover of the Company. ​GuideCap Partners acted as financial advisor to the Board of Directors.